“Conditions might not be the best, but they’re pretty good, and it is August” Dan said to me as we hiked up the Zigzag Glacier. 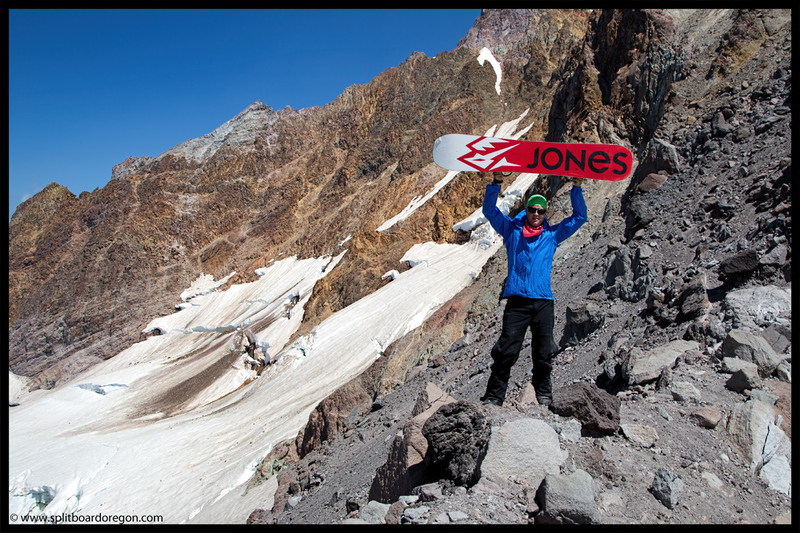 If there’s one thing that defines summer snowboarding for me, it would have to be that quote. 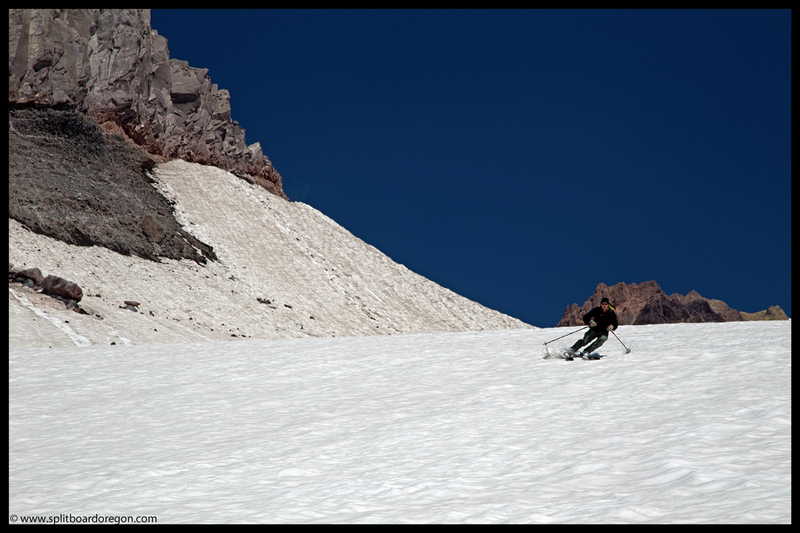 Such was the case this year as Dan and I headed up to Mt Hood in search of summer turns on the Zigzag Glacier. 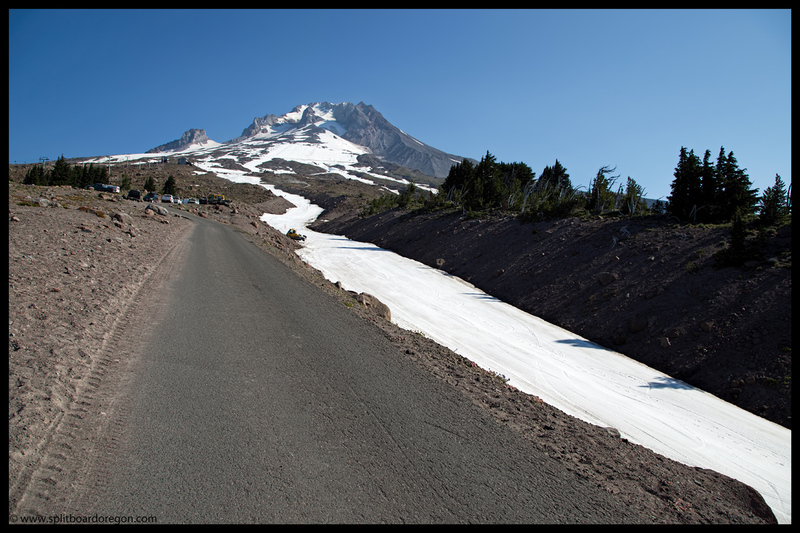 With most of this season’s modest snowpack having long since melted from Oregon’s volcanoes, we were hopeful the Zigzag would still be in condition for turns. 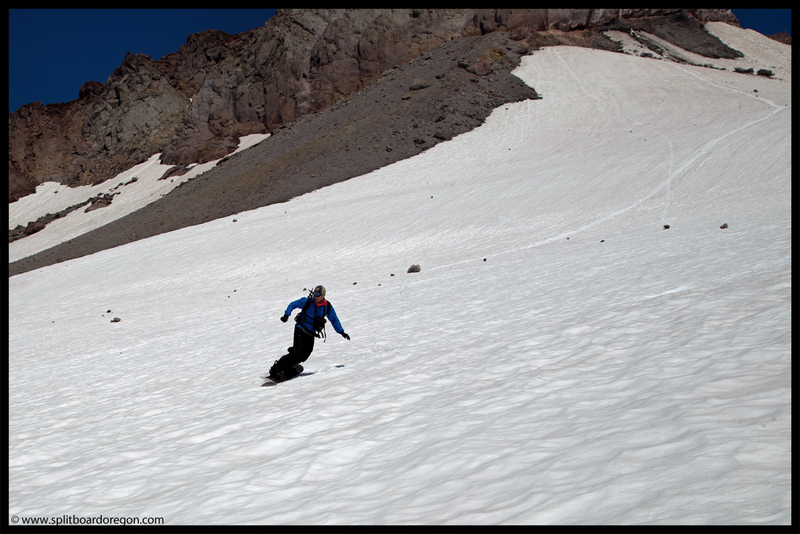 If not, the Palmer snowfield would have to serve as an ample backup. Arriving in the parking lot around 8:30 am, we quickly loaded our packs and hit the trail, electing to leave skins behind and travel light. The mountain looked like it usually does in August, with the Mile Canyon still in good shape for turns nearly down to the parking lot…. 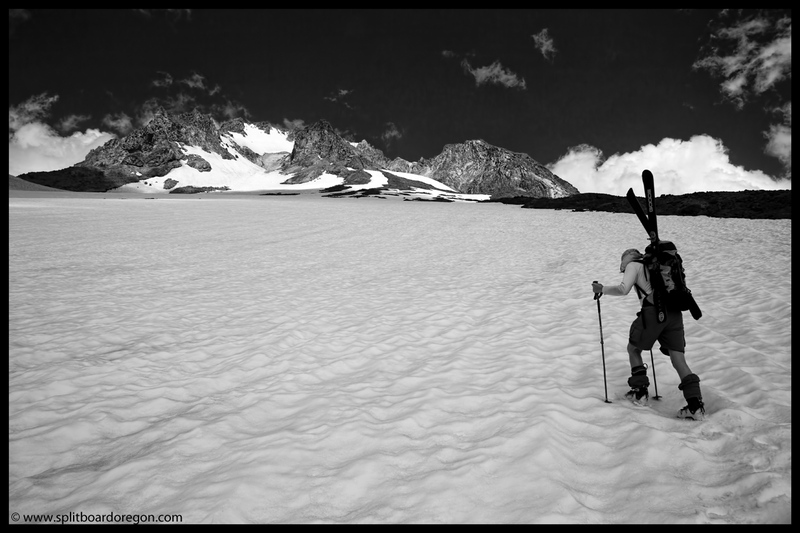 Within thirty minutes we exited the ski area and headed west, winding our way through gullies and open scree, eventually linking up with some remaining snow patches that provided easier travel to the higher elevations. The Zigzag Glacier itself was a bit runneled and suncupped, but looked like it would ski without too much trouble, and as Dan reminded me, “it is August.” As usual when hiking up the Zigzag, Illumination Saddle looks like you can reach out and touch it, but getting there always seems to take longer than it should. Eventually, we reached the saddle and enjoyed the excellent views down onto the Reid Glacier. Gazing over at a large rock perched above the Saddle, Dan noted he couldn’t believe it was still there, having seen it last year and thinking by now it would have surely fallen. After enjoying the views and eating a quick snack, we shouldered our packs and prepared to ride some August corn. Before we strapped into our gear, I snapped the below photo of Dan looking over the Zigzag Glacier….. Dropping off the Saddle, the bumps were pretty rough, but not as big as the previous September. 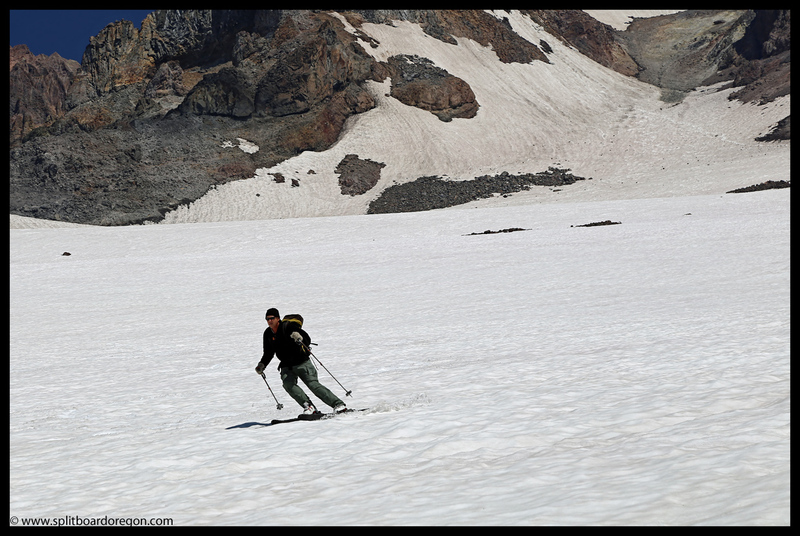 We picked a line to the riders right of the glacier, which seemed to have the smoothest snow. 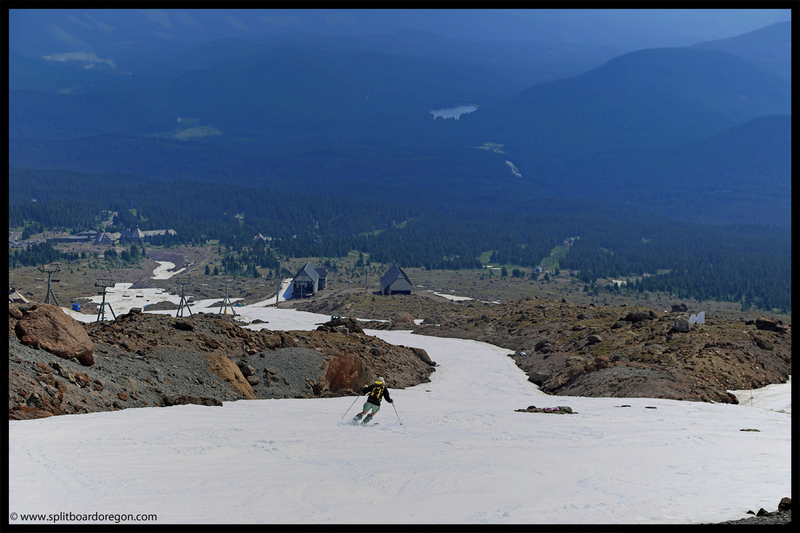 Though a bit bumpy, the snow actually skied pretty good, and we were stoked to be enjoying good turns in August…. 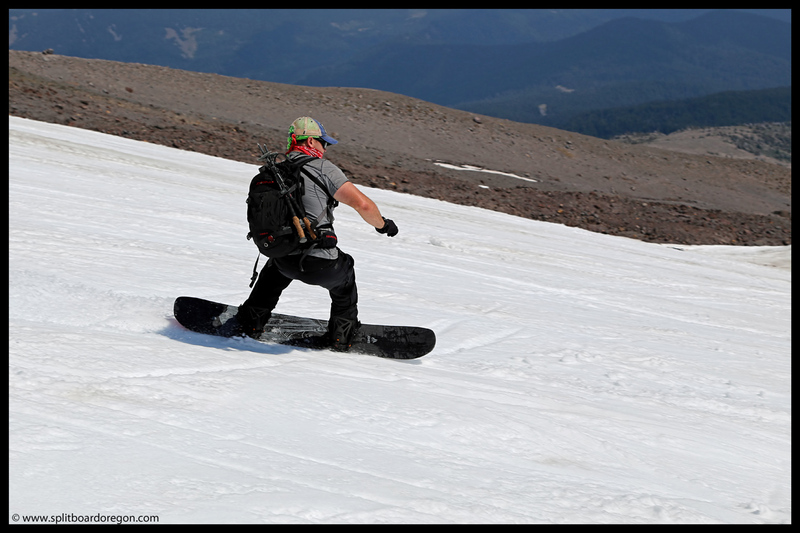 Partway down the glacier, Dan grabbed my new Canon 6d from me and snapped a series of shots of some August snowboarding action, including the photo below……. 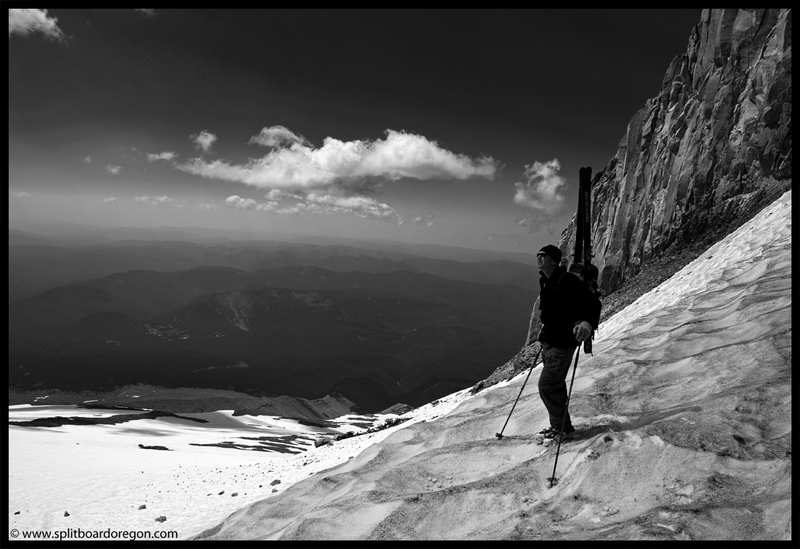 The weather held off and eventually, after a hot and sweaty bootpack back up to over 9000 feet, we traversed the Zigzag back over towards the Palmer snowfield. Booting the last little bit to the top of the Palmer, we arrived just as Patrol was heading down for sweep about 3:00 pm. A minute or so later, we met a couple of other turns-all-yearer’s and chatted for a bit. Sitting at the top of the Palmer with nobody around in the middle of summer is something I always look forward to. Before long, we strapped into our gear and prepared to shred the Palmer….. Riding the Palmer with nobody around is even better than chilling at the top with nobody in sight! Being able to open it up and rip as fast as you want is damn fun! We chose the line right down the center, just to the right of the public lane. The cool thing about riding after the snowfield is closed is that there aren’t any gates or fences dictating where you can ride…. After a brief stop at the Palmer mid-station to rest tired legs, we continued down the rest of the canyon, finding great snow all the way down. Here’s a shot of Dan cruising down the lower Palmer canyon…. The lower Mile was excellent cruising, and we skied to within a few hundred feet of the parking lot. A celebratory Oakshire IPA hit the spot after it was all said and done, and it’s always a good feeling tip back a beer in the summer sun after a good day of riding! Reflecting back on the day, it may not have been the most epic conditions, but it was indeed pretty sweet! 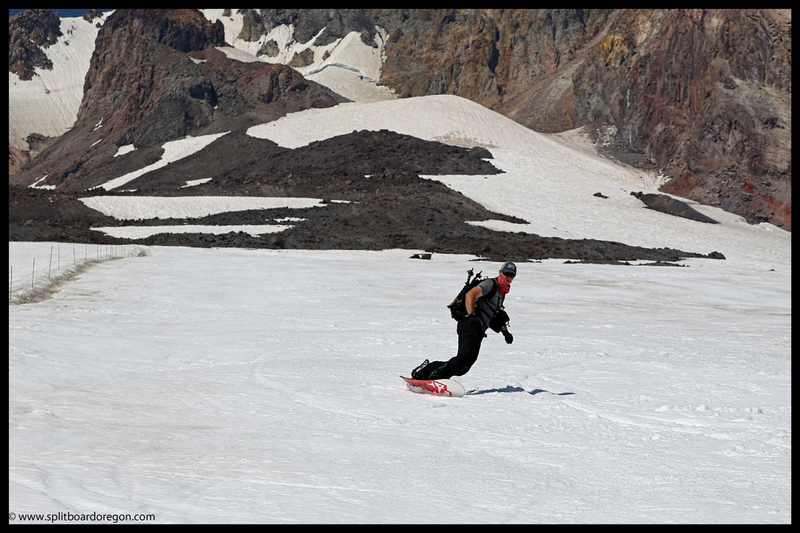 Here’s a parting shot from the day of Dan enjoying some turns on the Zigzag!